Please note that I have italicized and boldened Mr. Bettman’s last phrase. He could have ended his comment after he said we’re not planning on moving Phoenix but he threw in that last phrase, “as we stand here today.” That does not seem to omit future consideration of moving the team. R Q 2: Is any decision on Phoenix imminent? R Q 3: Well, what time frame are you operating on? R Q 4: Do you have multiple…Can you give us an update on Phoenix? In Commissioner Bettman’s answers to Q 2, 3 and 4, I would bet you he said the same things in 2010, 2011 and 2012. R Q 5: In terms of keeping the team in Glendale or…? What is unsaid is just as relevant as what was said in this response and that is we haven’t been exploring alternatives right now. R Q 6: You haven’t explored relocation? It is interesting that this question went unanswered and was meant to direct attention away from relocation. Apparently it was successful because the reporter’s follow-up question is related to the time it has taken. R Q 7: Why do you think that is…going for a long time? R Q 8: Is the city any more cooperative? The Commissioner’s response corroborates what has been widely suspected and that is the NHL will select a buyer and bring the deal to Glendale to take it or leave it. The NHL certainly wasn’t this solicitous of the time and resources the city used on a parade of previous suitors. R Q 9: Could there be some kind of combination of previous suitors? The Commissioner is reluctant, as obviously anyone would be at this point, to reveal any of the suitors or their deal points. R Q 11: Is insurance the main issue this week? R Q 13: Can you tell us when the meetings are and who is meeting? B A 13: “I think the meetings are either Wednesday or Thursday. 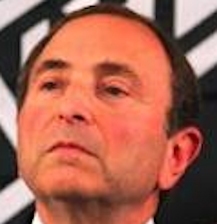 NHLPA, IOC and double IHI. R Q 14: How close are you following the NBA Board of Governors and the potential of the Seattle arena going in? Do we really think so? R Q 15: Does it affect Phoenix? I wouldn’t be commenting on Seattle as a relocation possibility for Phoenix either. R A 16: Seattle in general. Do you have any thoughts on that as a potential hockey market? Look for a team in Seattle in the future. Whether it turns out to be the Coyotes or another team, only the Commissioner knows and he’s not telling.